I got to slide down the sliding rock at Qunu where Madiba and his friends (as well as many local kids before and after him) played as children. Some of you seem confused so let me explain. 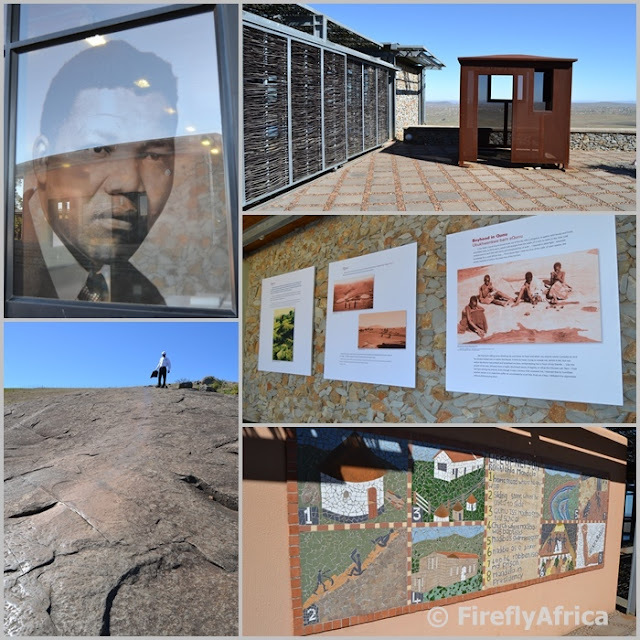 On a recent trip up the Wild Coast I stopped at the Nelson Mandela Museum in Qunu and was taken on a tour by one of the guides. 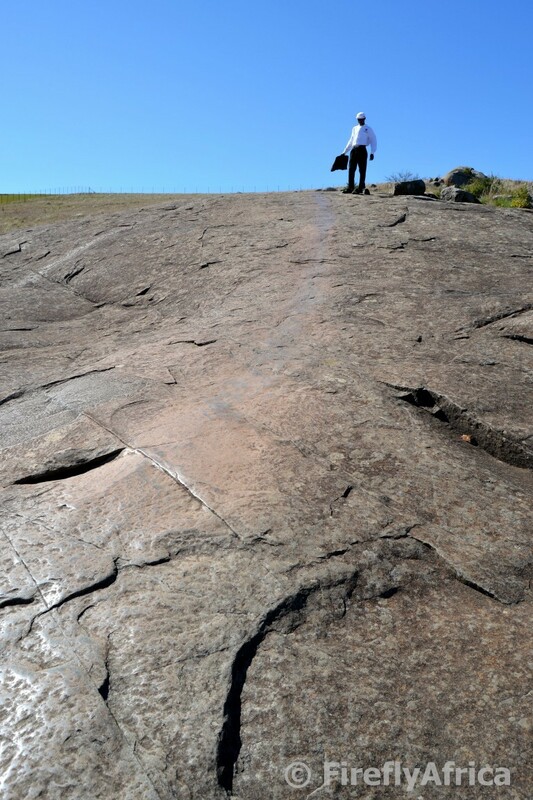 Part of the tour takes one about 200 meters away from the museum buildings to a couple of granite rocks on the side of the hill on which the museum is situated. 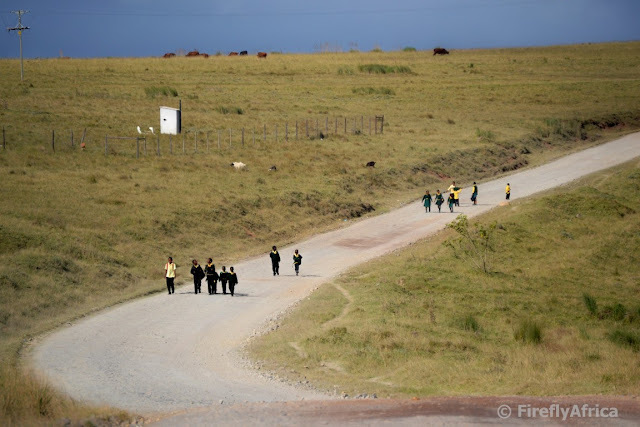 It was on these rocks that local kids, including Mandela himself, came to play. Back then the kids would slide down the rock sitting on pieces of wood or whatever object they could find that would slide across the rock. While walking down I wondered why the guide was carrying the plastic seat section of a chair (like the ones we used to sit on during assembly at school). The answer came very quickly as he demonstrated before handing me the seat. It was time to slide. At first you wonder if you would actually be able to go down on the seat and the next moment you've got to throw out anchors cause that rock is a lot smoother than you think. It may not be able to compete with "adrenalin activities" like zip lining or kloofing, but the experience is just as memorable because of where you do it. 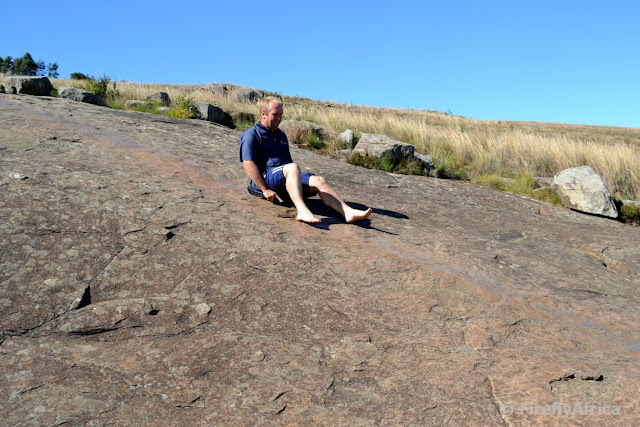 I can imagine a couple of boys going home with bruised knees and toes after a day at the sliding rock though. Doesn't this just shout out Wild Coast to you? A winding dirt road, rolling hills dotted with huts and villages and a beautiful rugged coastline second to none. If you have never been there to experience and see this for yourself, then you really must make a plan cause you are missing out. 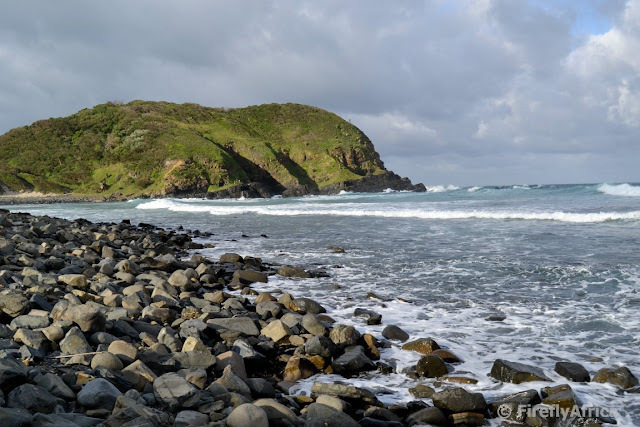 The photo was taken on the road between Coffee Bay and Hole in the Wall. 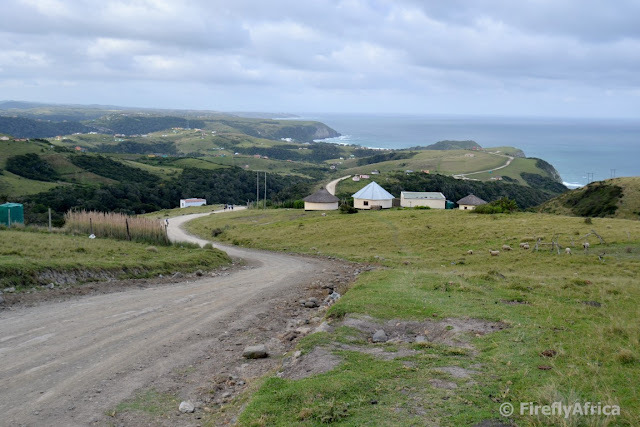 One of the first things I did when I knew I was getting to explore the Wild Coast a little bit was to check if there will be any Geocaches on the route I was going to follow. Although there weren't a whole lot I made sure I saved those I would be able to do on my phone before hitting the road. Driving along the gravel road to Wavecrest Hotel I had a look to see where the closest cache was and to my surprise it showed about 3 km down the road. A short while later I turned off the main road to my right and followed that road for a kilometer. I parked next to a stream flowing over the road and hopped out. From here a path took me around the small gorge that opened up in front of me to a view point from where the Takazi Waterfall was visible. 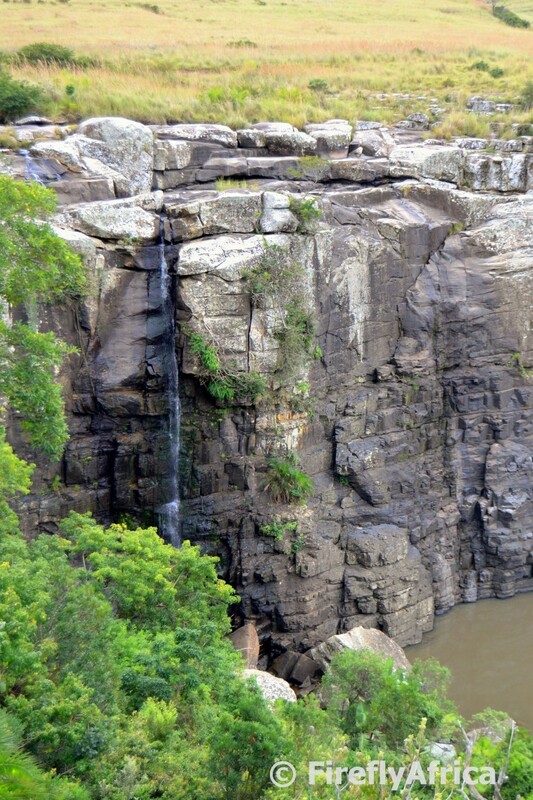 The Takazi Waterfall may not be one of the Eastern Cape's big and well known waterfalls, but it still was a sight to behold. I could also imagine what it must look like after good rains. My point though is that I would never have known about this waterfall if I wasn't a Geocacher. There was no sign at the turnoff nor where I parked. The waterfall isn't even marked on a map. I would have driven past it barely a kilometer away if there wasn't a Geocache placed there. A Geocache which, I have to add, I unfortunately couldn't find. But that could be a very good excuse to return some time in the future for another look. A would love to revisit Wavecrest again anyways. The sun low over the horizon. A slight sea mist along the coast. Small waves lapping the shoreline. The Wild Coast has always been one of those within reach yet just a tad too far away destinations for me. 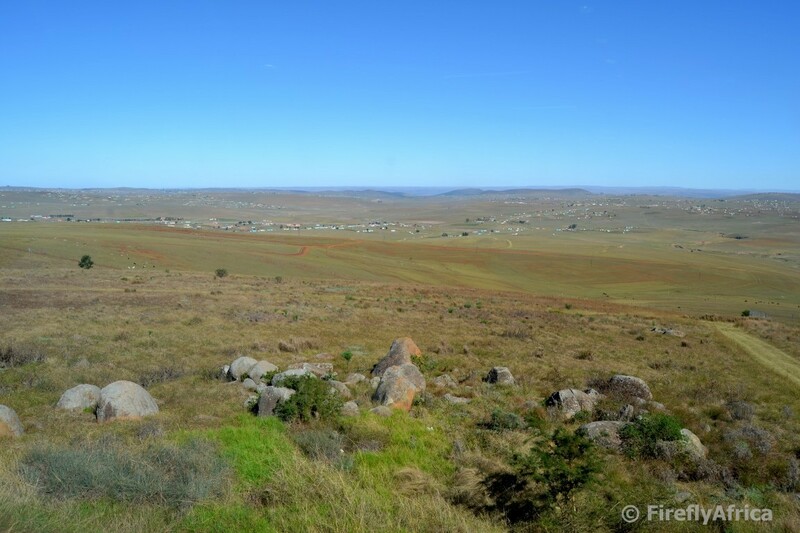 Living in Port Elizabeth I have travelled down the Garden Route and through the western part of the Eastern Cape quite extensively, but the Great Kei River beyond East London was like a hurdle I just didn't get to cross that easily. That was until I planned a short Wild Coast road trip as part of a journey to Durban. After my experience I have to say the title of this post should actually be the good, beautiful, good, scenic, good, lekker, good, awesome and a little bit of bad and ugly of the Wild Coast. Please don't stare yourself blind against the bad and ugly and crucify me for mentioning it. The only reason I put it in here is to let people know to expect it and not to try and put them off. In actual fact, the reason for this post is the total opposite. 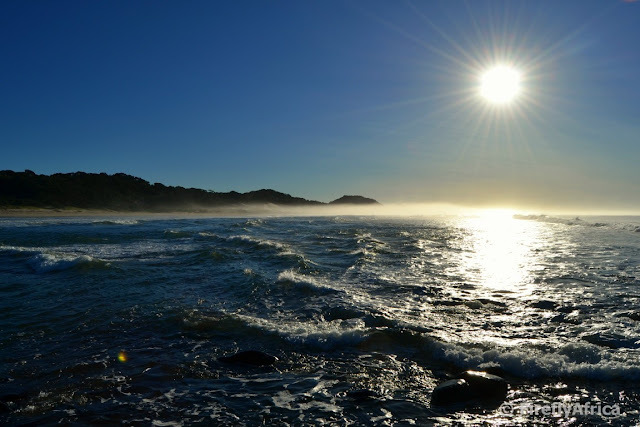 I want people to go and experience the Wild Coast like I did. So lets get going. After a Monday morning meeting in East London I pointed the Polo up the N2 to Butterworth from where the road took me south to Kentani. That was where I hit my first dirt road which was the first bit of ugly of the trip. The ugly quickly gets neutralised though by the rolling hills covered in villages, friendly people waving and unusual scenes you just don't get to encounter in the city. Just keep an eye on the road and make sure you bob and weave around the potholes and you will be okay. 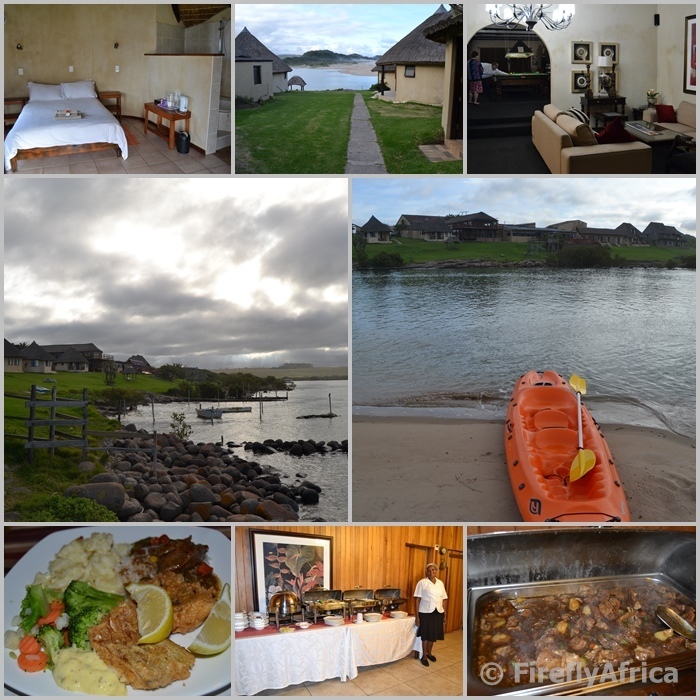 The Wild Coast is literally one big surprise after another and arriving at Wavecrest Beach Hotel was no different. WOW! with capitals and an exclamation mark at the end. 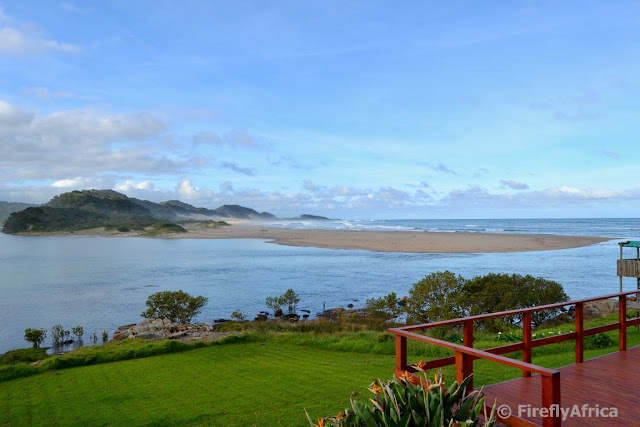 Wavecrest is situated on the banks of a lagoon (and a stone's throw from the river mouth) where the Inxaxo and Ngqusi Rivers flow together and immediately became one of my favorite Wild Coast locations. A very friendly receptionist greeted me at arrival and after checking me in took me on a tour of the hotel and facilities... in her slippers. At first I thought it very strange but then I realized that it was the first sign of how laidback the place really is. 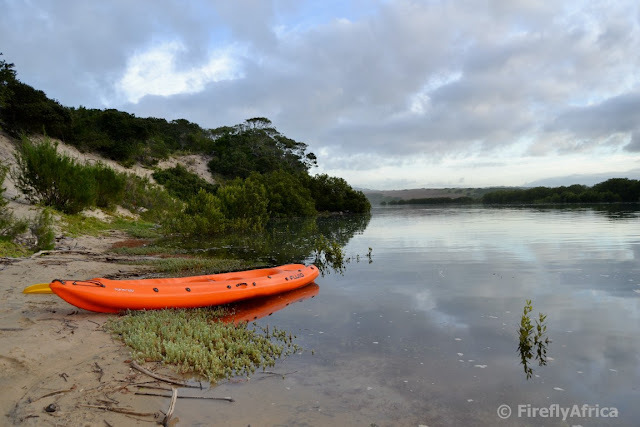 I dropped my bags in my rondavel, changed into shorts and slops and headed down to the river where I grabbed one of the hotel's kayaks and paddled out onto the lagoon. Which way to go? Up the Inxaxo or the Ngqusi? What the heck! Why not do both? It wasn't long before I found myself between the mangroves with the only sounds being the distant ocean and a couple of pied kingfishers dive bombing into the water around me. What more do you want? Before I knew it the sun was starting to head towards the horizon and I had to start paddling my way back to the hotel while making a mental note that I will have to come and do this again properly at some stage. Back at the hotel I decided to explore a bit and discovered that the hotel has 30 units ranging from doubles to family units all either garden or river / sea facing. The hotel also have various public areas including a full snooker table games room, TV "cinema", lounge and bar area. I grabbed a ice cold Savanna from the bar and found myself a spot with a view out on the verandah to wait for dinner time. It was here that I met the hotel's general manager taking a stroll around. Guess what? He was also in his slippers. Take that suite and tie people! 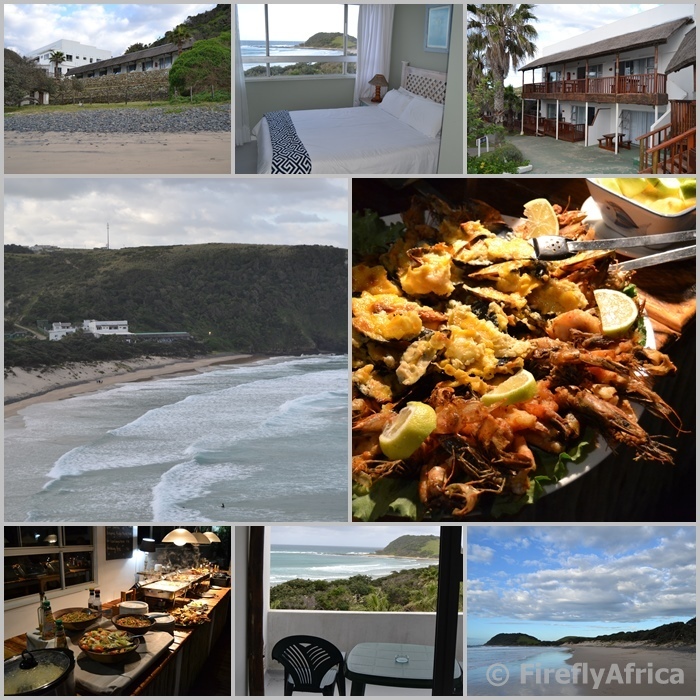 Like so many of the other Wild Coast hotels Wavecrest offers an extensive dinner buffet. As it was midweek and midterm there weren't a lot of guests in-house yet the selection of food on the buffet was still way more than what I could try out. The plan was to be up before sunrise the next morning and get a couple of pictures of the sun breaking the horizon. I never set my alarm and woke up with a start... Was it too late? I threw open my door and noticed the sun was moments away from showing itself. Talk about timing. I grabbed my camera and rushed out. Seemed a couple of other guests had the same idea as I was joined on the river bank by two others doing exactly the same. Taking photos of a sunrise on the Wild Coast. See two of those pics here and here. This was followed by a walk out to the river mouth from where I could look back at the hotel. Ah, I wish I could have stayed longer. 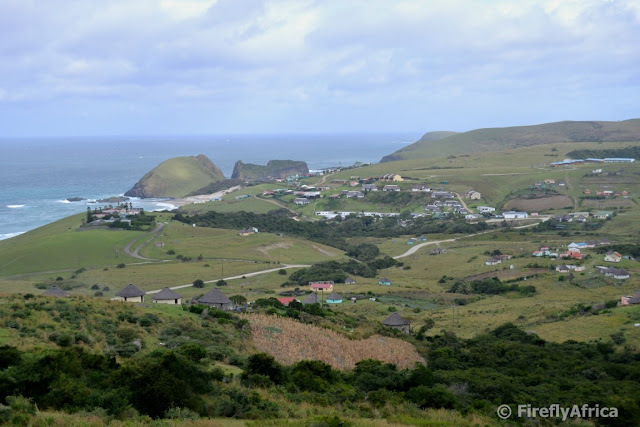 After breakfast it was time to hit the road back towards Butterworth to continue my Wild Coast adventure to Coffee Bay via a stop at the Nelson Mandela Museum in Qunu. On my way up the gravel road I was stopped in my tracks by a typical Transkei road block. 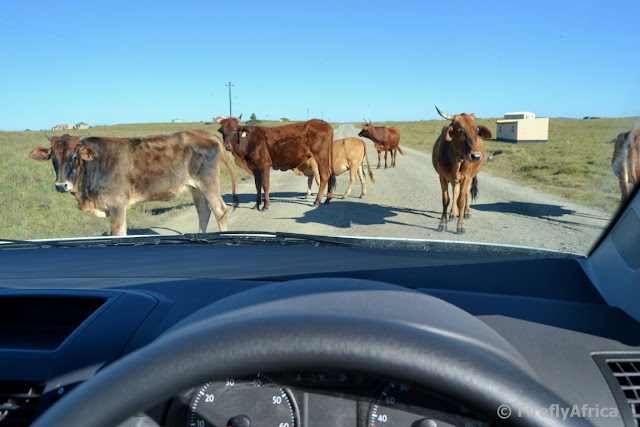 These guys just didn't want to let me through, approaching on all sides to check my license and probably the state of my tyres. Eventually a couple of young guys coming past had a word with them and I was allowed through. I should have just told them to mooooo've. Hitting the tar I was on my way at full tilt again with the next stop being Qunu. 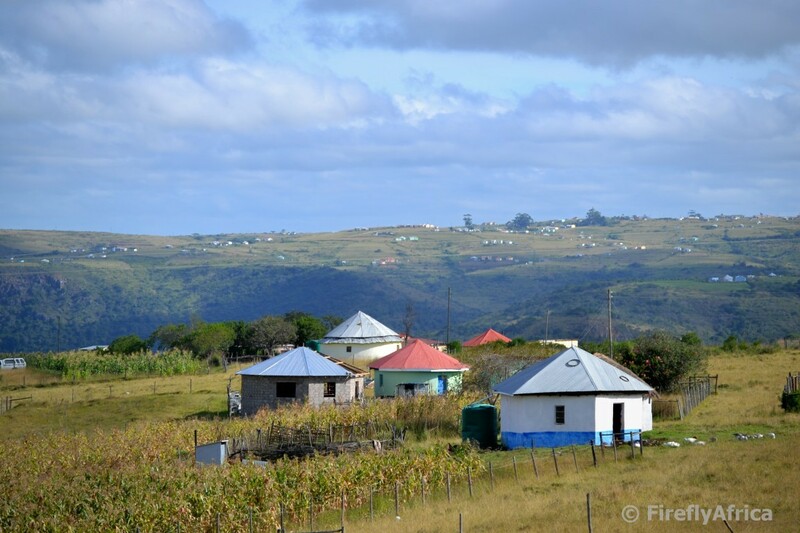 Qunu is where former president Nelson Mandela grew up as a young boy, with his birthplace at Mvezo not far away. It is also where Madiba's family home is and you pass the homestead on the right just before getting to Qunu. 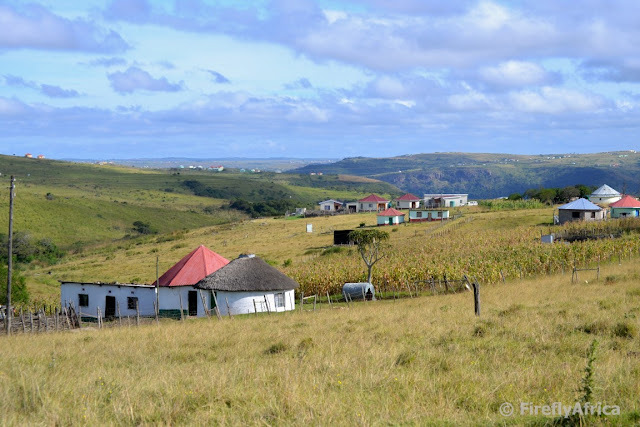 I have never been to the Nelson Mandela Museum in Qunu and decided to stop for a quick look. I wasn't quite planning to do the tour but changed my mind when I was met at the entrance by one of the guides. Unfortunately I'm going to lie to you if I didn't say I was slightly disappointed. They can really do so much more with the museum and what they have on display. Most of the museum's exhibits are nothing more than a few photographs with information on the walls in two rooms that visitors have to read. I was expecting more things associated with Mandela like I have seen in the Mandela exhibit in the Apartheid Museum in Johannesburg recently. But on to the rest of the tour. The view from the museum stretches for miles and the guide pointed out a few places of note. We then took a walk away from the buildings down to the sliding rock. The sliding rock is where Mandela and the boys from the village came to play. They would slide down the rocks and there are a few spots where you can see the rock has been smoothed over the years with all the boys going down. Definitely the highlight of my visit was going down there myself. But more of that in another post soon. The museum does offers guided tours to all the significant Mandela sites in the area and if you have time, doing that would be worth a lot more than just visiting the museum. Next stop... Ocean View Hotel in Coffee Bay. Driving into Coffee Bay after negotiating another stretch of potholed dirt road, I was slightly bummed. 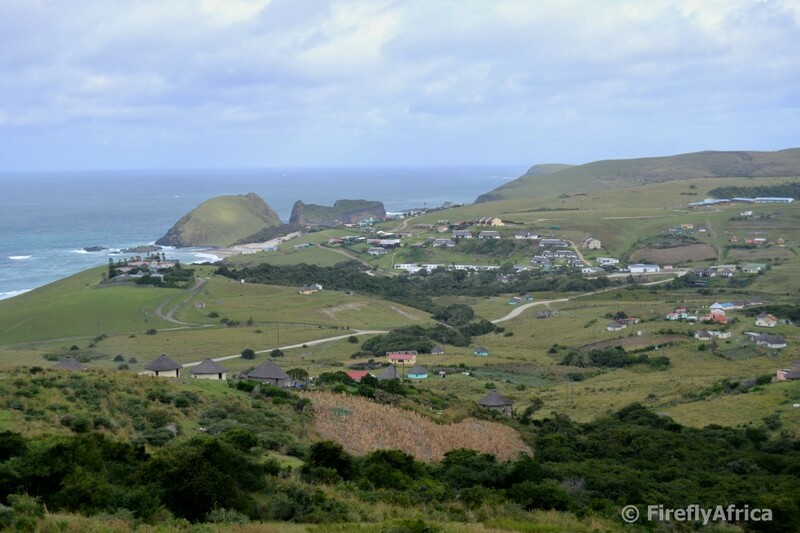 I was expecting this quaint little village on the coast, something like Wilderness on the Garden Route. It didn't quite look like the picture I had in my head. Don't ask me why I thought that. You just sometimes tend to imagine something a certain way it Coffee Bay wasn't what I imagined. The village quickly took me by the shoulders and shook me awake though, showing me a place with character. Various characters actually. Quirky characters, quant spots to eat and drink, friendly people and more stunning scenery. Didn't take long for me to create a new picture in my head and disappointment quickly took a walk out to sea and disappeared under the waves. Unfortunately part of disappointment returned to me shortly later. After checking into the hotel I decided that I had to go and see the Hole in the Wall. 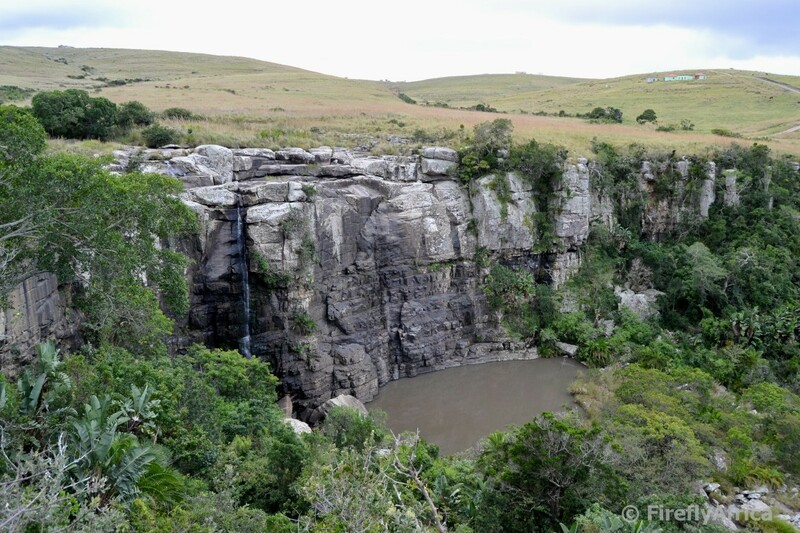 How can I say I have been to the Wild Coast and am an expert on the Eastern Cape without having visited Hole in the Wall? I asked for directions at the hotel and I can't say the receptionist didn't warn me about the road, but shortly later I was heading along a dirt road down the coast to the holy grail of Wild Coast attractions. This is unfortunately where I encountered the real ugly of the Wild Coast. Not just one ugly. More like two ugly step sisters causing a lot of harm to the beauty everybody wants to see. Firstly there was the road. Parts of it made the general potholed dirt roads looks like a smooth as glass tar road. Going down two of the hills en-route I had to literally get out my car to find the best route through the dongas. When I finally negotiated my way along to the grassy parking area, the ugliest of the two step sisters stepped up. I was suddenly swamped by informal guides wanting to look after my car and "guide" me to Hole in the Wall. "Its only 10 minutes walk mister," one told me. "I'll take you and will show you." No, I didn't want him to take me or show me. In actual fact, I felt intimidated. I also didn't feel comfortable leaving my car with the lot around and decided that I didn't have to see the Hole in the Wall to be able to say I experienced the Wild Coast. I turned around and negotiated my way back through the dongas, snapping the picture above with the Hole in the Wall just visible in the distance. 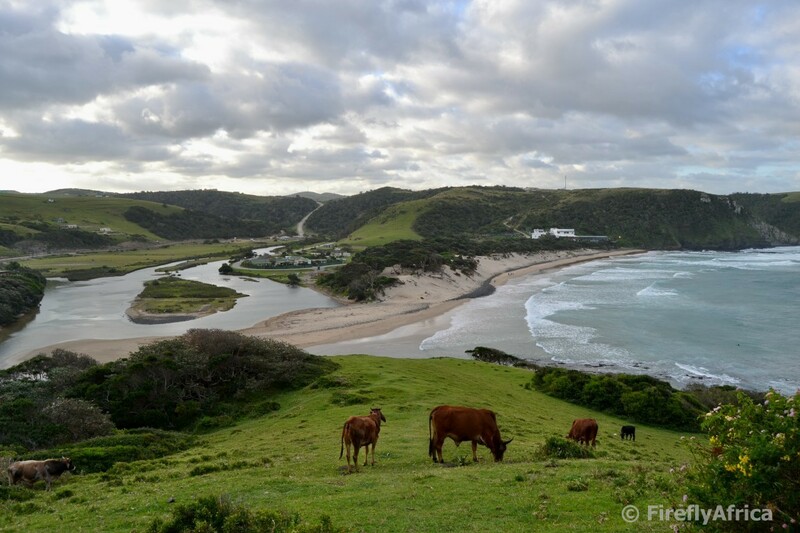 I promote the Eastern Cape and thus also the Wild Coast every day. When it comes to the Hole in the Wall though I will now in future change my angle to tell people to book a tour from their accommodation establishment which will take them there in a 4x4 and has its own guide on board. A much less stressful option. I wasn't going to allow my Hole in the Wall non-experience to get me down though and decided to go and climb the hill between the main beach and Bomvu Bay. This wasn't a bad idea at all. The walk took me along the beach and through the shallow Nenga River mouth. From here I followed a path up along the sea side of the hill, eventually looking probably a good 50 meters straight down on the sea below. The view from the top was amazing looking down on the village on one side and the coastline on both. Really worth the climb and fully (ok, mostly then) made up for the earlier disappointment. The Oceanview Hotel didn't just get its name because the hotel is close to the ocean. It got it's name from the magnificent views of the ocean. Something that seems to be a prerequisite for any Wild Coast hotel. My room was in the main building above the restaurant area and had the most stunning - so much more than just decent - view down the main Coffee Bay beach. I wanted to take a walk into the village before dinner and grab a drink at one of the quirky bars I mentioned earlier but changed my mind when we were plunged into a deepest darkest Wild Coast situation. Eishkom implemented loadshedding. Instead I enjoyed a drink on the hotel balcony listening to the sea which was not even a hundred meters away. The traditional Wild Coast buffet made an appearance and like the previous night I stood there with a couple of decisions to be made. Stew, curry or seafood, salad or veg, do I have soup for starter, which dessert to end the meal with? So I had a bit of soup and then hit the seafood platter. Prawns, calamari and mussels. And just in case you wondered. I ended with the cheese and biscuits rather than sweets. Back in my room I decided to read a bit but left the balcony door open. Eventually putting my book down, switching off the light and just listened to the ocean. How I wish I could hear the sea like this from my house. After an early breakfast it was time to hit the road again. The plan was to head further north, swing by Port St Johns and then aim for the Wild Coast Sun. By now you've figured out what the ugly part in the post's title is. But what would be the bad? For me the bad of the Wild Coast are the children. Not them being children but what they do. Every time one passes kids on the road they shout, "Sweeeeets". Apparently it is something that has been happening for a very long time and not something anybody would be able to stop very quickly. So why would I put this in a travel post? I want to ask people not to oblige them by handing out sweets every time they encounter kids. As long as people do it this kind of begging will continue and it can't be good for either the kids or the image of the Wild Coast in the eye of visitors. Just my 5c worth. 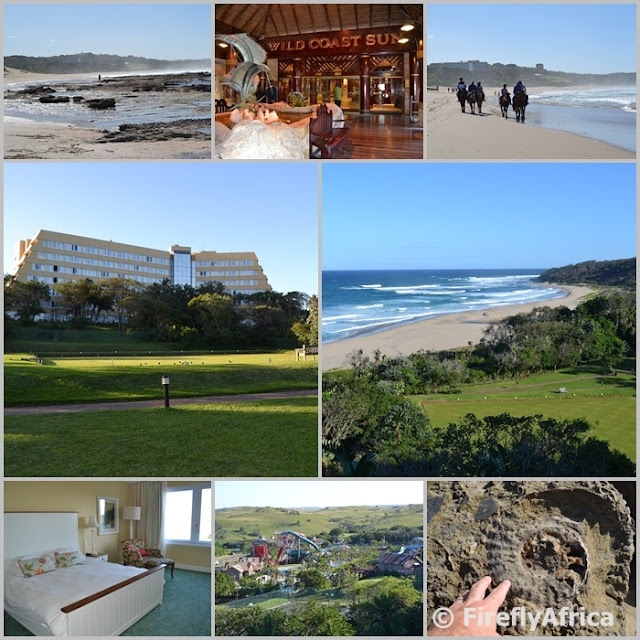 Although there are a lot of other Wild Coast hotels along the coast I still want to visit, I decided to organize my last night of the trip at Sun International's Wild Coast Sun. The hotel is nothing like the typical Wild Coast properties and include a casino, a lekker water park, sports facilities, lots of entertainment options and more. The one thing that makes it similar to the other Wild Coast hotels is the location. On the coast with, yes you guessed it, beautiful coastal views from the rooms higher up. I can already hear somebody ask why I decided to go there and not to another one of the "traditional" Wild Coast hotels. Fossils. Fossils? Yes, you heard me right. Fossils. The Mzamba Cretaceous Deposits, referred to as the Mzamba Fossils and Petrified Forest Trail, is located on the beach right next to the hotel. I joined a couple of other guests on a tour the next morning led by fossil guide Benny Mbotho. Benny walked us about a kilometer or so down the coast from the hotel before he started pointing out the first of the petrified trees lying in the shallow waters of the exposed reef. That was when I realized that my timing for the trip was just right as doing the tour at high tide would have meant that I wouldn't have gotten to see the petrified forest part of the tour. I have a couple of pieces of petrified wood in my collection that I got from my father-in-law, but they don't come anywhere close to what we got to see. 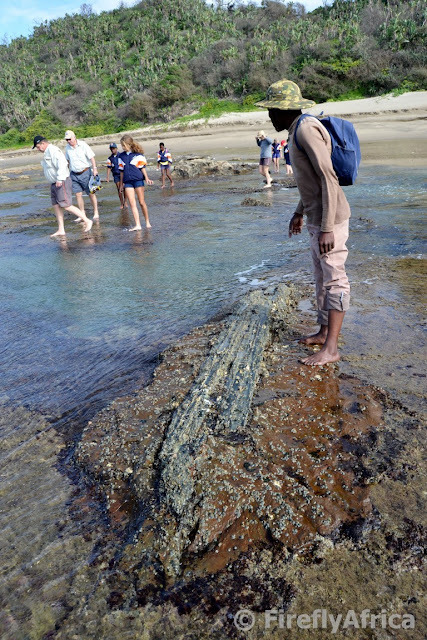 Huge fossilized logs imbedded in rocks. Even if we saw nothing else it was worth the trip. But it wasn't all. Just down the beach from the petrified forest next to a series of cliffs and overhangs known as White Man's Cave, came the next group of fossils. The deposits consist of greyish-brown sandstone, as well as limestone, rich in fossil material dating back 80-million years. 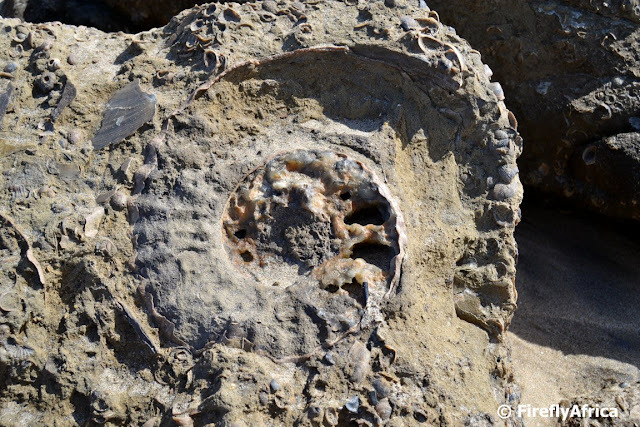 These deposits include masses of marine shells, among them stunning examples of coiled ammonites, echinoids (sea urchins) and bivalve shells. Benny also pointed out a fossilised sea turtle and huge clam shells. My mind was all over the show. This was an experience not to be forgotten if you have an interest in fossils. 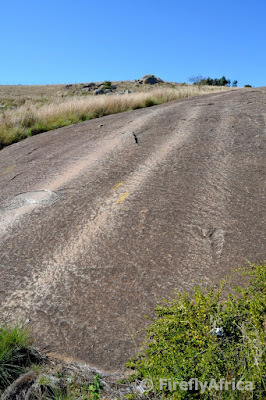 The Mzamba Cretaceous Deposits should actually be one of the prime attractions of the Eastern Cape and be on most itineraries through the area. Before I knew it my three days on the Wild Coast was over and done with. Disappeared like mist in front of the sun. Gone but not forgotten. I think the biggest problem with this trip is that I just want to go again. I want to see more, visit more places, stay in more of the hotels, meet more people and obviously do more of the Geocaches (which you will notice I didn't keep mentioning in this post for a change *smile*). It means I will have to find another excuse to go again... and again... and again. To hell with the bad and ugly, pack your bags, fill up your car, check your spare tyre and head on over. 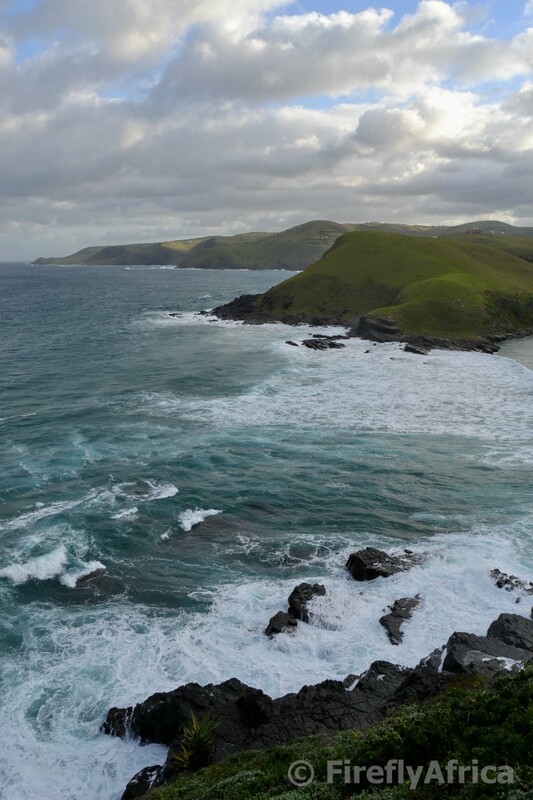 The Wild Coast is waiting and calling your name. 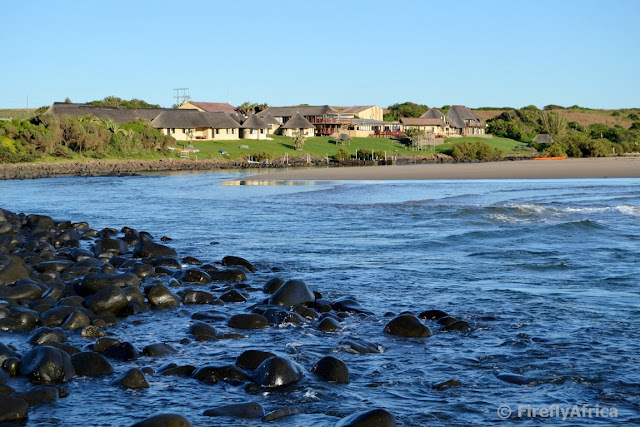 Disclosure: I received a generous discount from Wavecrest Beach Hotel and complimentary stays at Ocean View Hotel and the Wild Coast Sun due to my involvement in the tourism industry and not because of being a blogger. My transport cost was covered by ECTOUR. I received no further remuneration, wasn't asked to write a positive post and keep full editorial control. Two of the best ways to keep the chills away this winter. 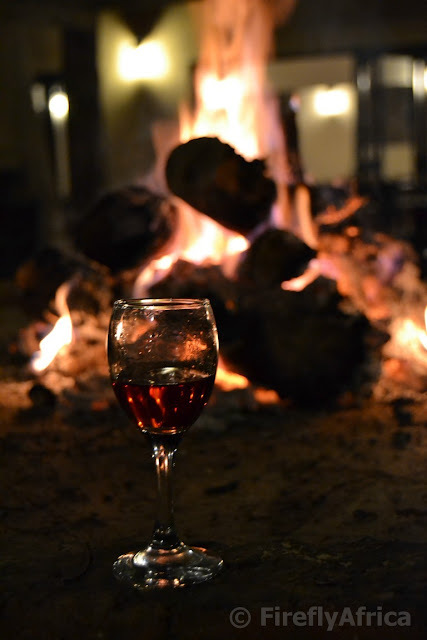 A glass of sherry and a crackling fire. The Wild Coast. 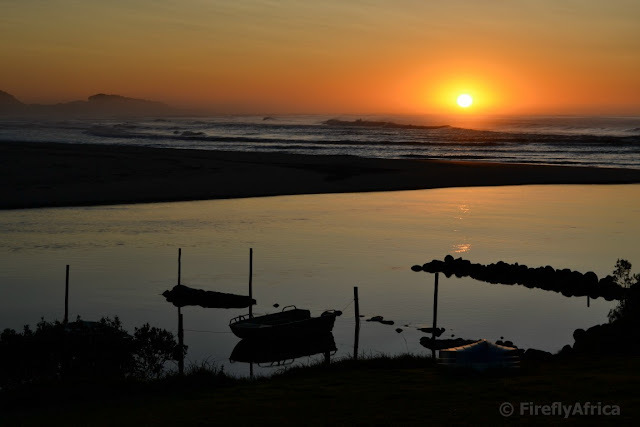 Creates pictures in one's head of rugged coastlines, rough seas, shipwrecks and storms... Or in this case a sunrise over the Nxaxo River Mouth on a windless morning. 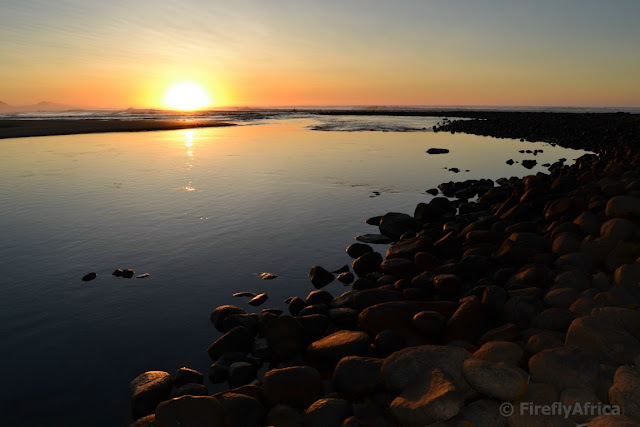 The Wild Coast is literally just a couple of stone skips away from where I am based in Port Elizabeth, yet except for quick visits to Morgan Bay and Trennereys I've never explored it properly. Some people even told me that those are situated on the Mild Coast and that I would have to venture further north to be able to properly say that I've been to the Wild Coast. In May circumstances allowed me to spend a few days doing just that while I was on my way to Tourism Indaba in Durban. I spent my first night at Wavecrest Beach Hotel and got up just in time to catch the sun rising over Nxaxo River Mouth. Now that is how a day on the Wild Coast should start. Every year on the last weekend of June, thousands of festinos make their way to the small Sundays River Valley town of Kirkwood for the annual Absa Kirkwood Wildsfees. 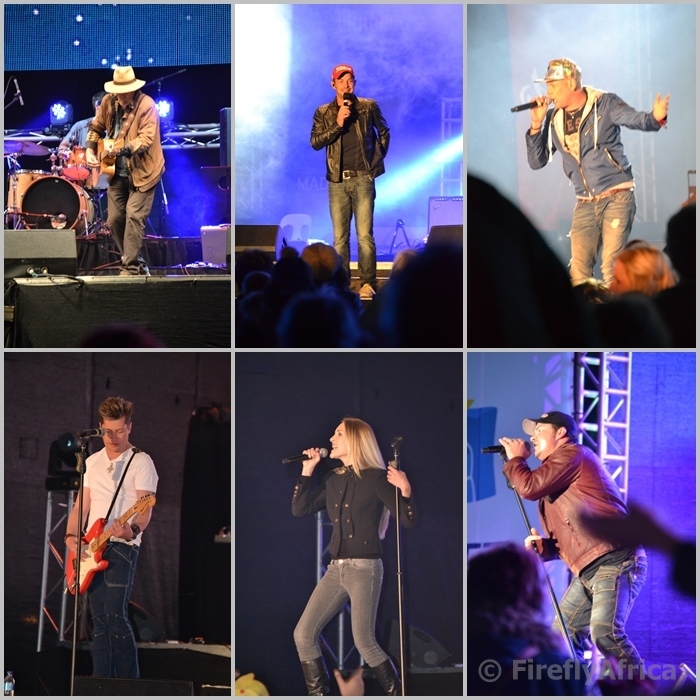 The Wildsfees, in it's 14th years already, brings some of the biggest names in the Afrikaans music industry to the town and combines it with a weekend of entertainment, activities, food and stalls. 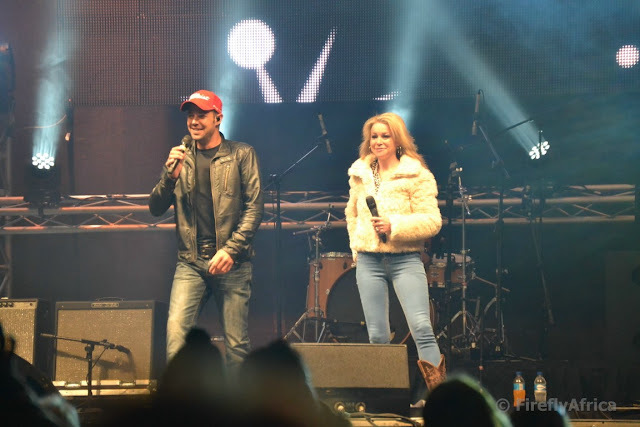 Over the weekend in the region of 50 000 people attended the festival with over 20 000 people in the grounds on the Saturday evening. We weren't planning to go to the festival this year but I got my hands on some tickets on #99 and after a quick call to one of my contacts in town, I found a spot in the backyard of Magnolia Guesthouse to pitch our tent. The weekend was on! The Damselfly was picked up after work and the KidZ from aftercare, the car packed and we were off to the Wildfees. After dropping off all our stuff at Magnolia just after sunset we headed to the festival grounds. 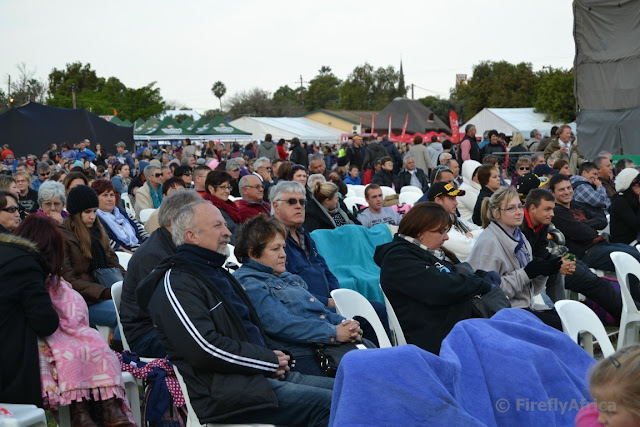 The plan was to grab a seat and enjoy the Friday night entertainment, leaving exploring the rest of the festival on Saturday before the main entertainment started late afternoon. Kirkwood be Kirkwood and late June being winter meant that everybody arrives at the festival prepared for cold. We were no different. 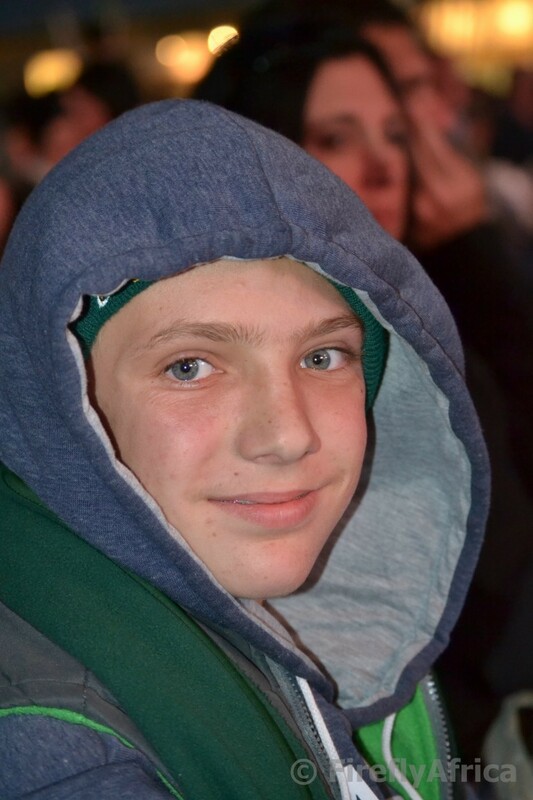 Jackets, beanies, blankies, the works. 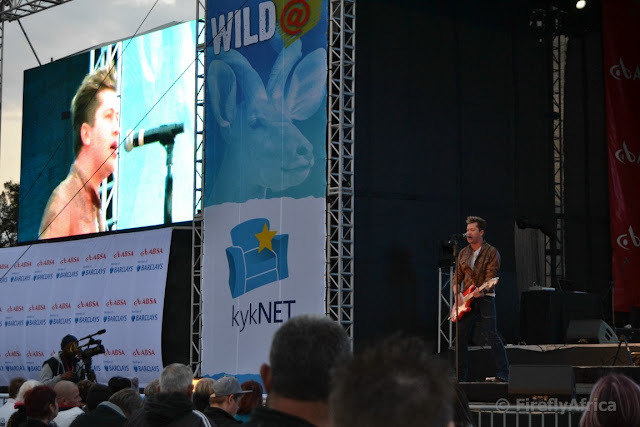 When we got there the Radio Kalahari Orkes was on stage. I really like a couple of their songs but struggle to sit through a whole CD of theirs. Seeing them on stage though was a totally different story. Wow, pure genius and lots of energy, specially from the only female band member. Love her on stage with her accordion. The main reason the Damselfly wanted to be there the Friday evening was the fact that her two favorite artists, Jay and Leanie May, were on stage right after each other. They also did their latest song, Naweeklyfie, together which is always a hit. Singer and actor Izak Davel kept the crowd entertained on the Saturday afternoon both during his performance as well as one of the MC's. I'm sure a couple of ladies in the audience still remember him strutting around in his red speedo on Survivor South Africa a couple of years ago. Some of the artists on stage over the two days that we were there (we and my wallet were all festivaled out by Saturday night so we gave Sunday a miss). Clockwise from the top left corner - Ian Roberts of Radio Kalahari Orkes, Jay, Snotkop, Nicholas Louw, Elizma Theron and Ray Dylan. 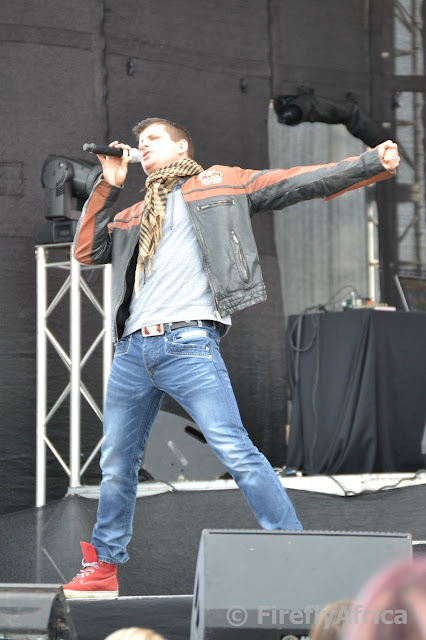 I just realized that I never got a pic of Kurt Darren who was one of the main acts on the Saturday evening. Two things mentioned by the artists immediately jumps to mind while I write this. 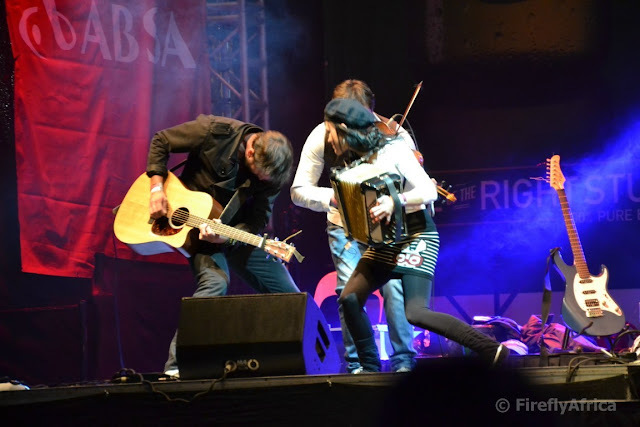 Firstly how much they enjoyed performing in front of such a huge audience and secondly how the stage and sound must be amongst the best they have performed on in South Africa. Both of these are huge compliments to both the organisers and the people attending the festival. I know the artists on show would all be able to rock an audience doesn't matter if they sing on a school stage, a street corner or from the back of a truck, but the stage and sound played a huge role to make this event such an fantastic experience. The stage with its speakers and lighting stretched over a distance of close to 50 meters and the sound was superb. Kurt Darren even commented how this was the first time in ages that he just walked onto a stage without a sound check and everything was perfect. Event Hire Network really deserves a lot of credit for the work they did. 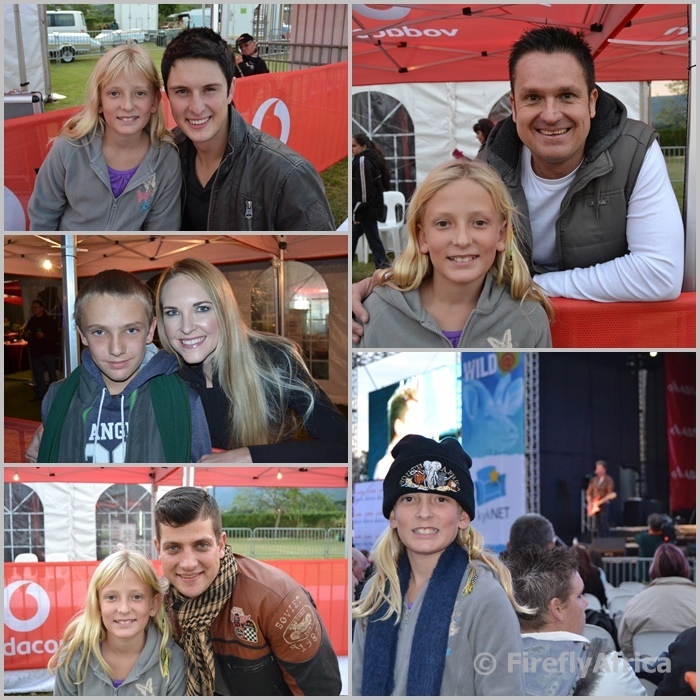 Obviously the KidZ, especially Drama Princess, made use of the photo opportunities with artists. 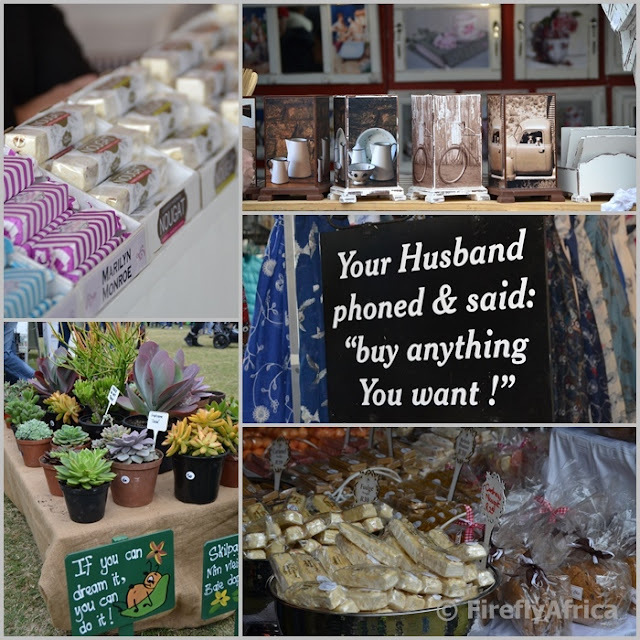 One of the things I particularly like about the Wildsfees is that they evaluate all stall applications and don't just allow anything and everything. It means that there aren't rows opon rows of foong kong fake goods stalls. The focus is rather on hand made quality crafts and products. I always think that if you want to make money at a festival then you have to have a food stall. Do your own math. 50 000 people, three day festival, entertainment all day long. People get hungry. People get thirsty. People need to eat and drink. It's not all just printing money though. The food stall people work long and hard hours. The food at the festival was yummy though. 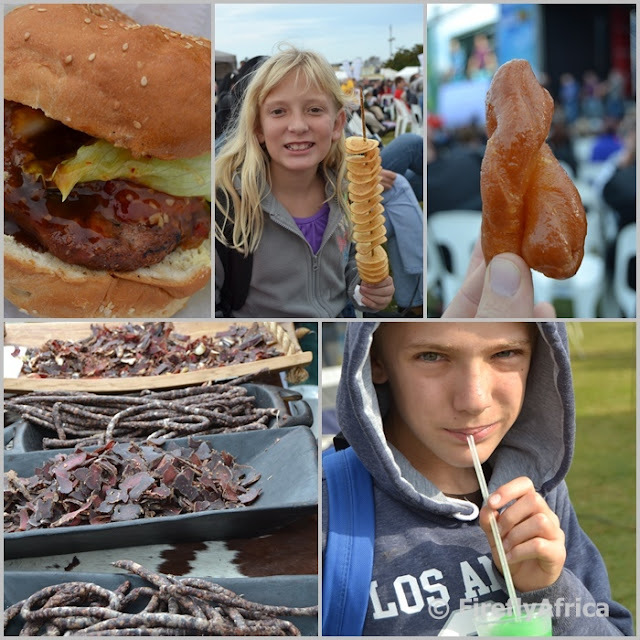 Everything from kudu burgers to fish and calamari, chip & dip to sushi, koeksisters to Chinese food and everything in between. Two places I didn't photograph, because I didn't visit it, were the wine garden and the beer tent. Sorry, I'm not really a drinker so I lost nothing there. My only negative comment about a festival like this is the amount of alcohol that people consume at it. Both these areas were packed all day long and wine bottles and beer cans were stacked up six packs deep. Not really my kind of scene. 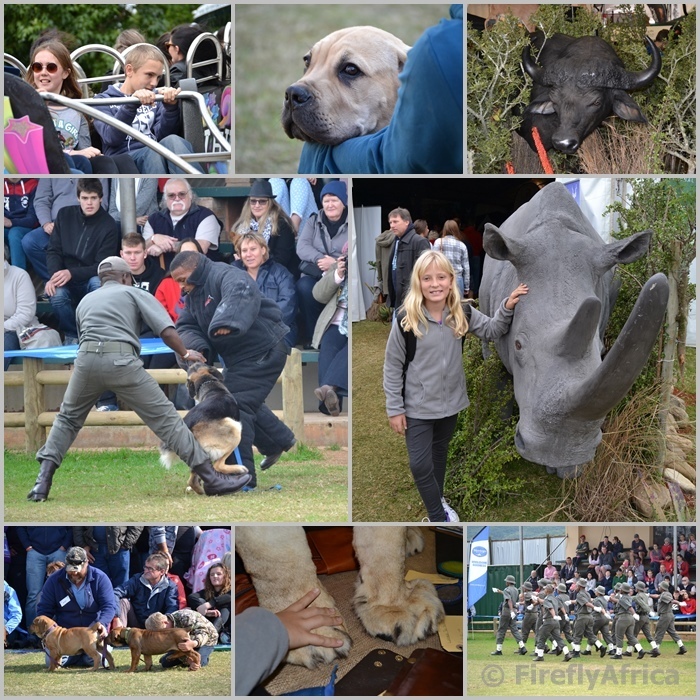 The festival also had a very popular display area where, on the Saturday, we first watched how a SANParks anti poaching dog took down a baddie before the annual Boerboel dog show. If you haven't been there you probably won't believe me, but the Boerboel show must be the most popular activity after the music on stage. People were pushing and squeezing in to get a spot to watch these magnificent dogs being judged. 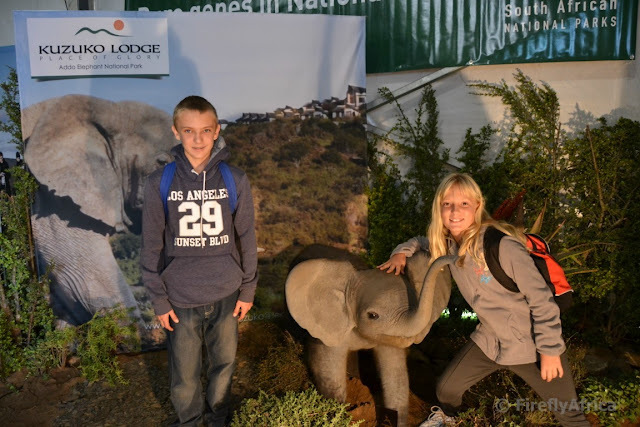 I was also very impressed by the conservation area in one of the tents where SANParks and a couple of other organisations were exhibiting. 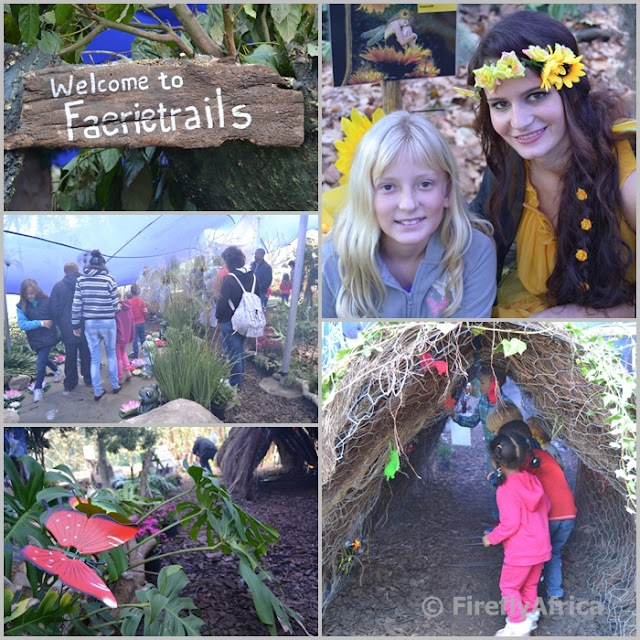 One of the new additions to the festival this year was a Fairy Garden... with real fairies. All in all the ABSA Kirkwood Wildsfees was a huge success this year. The weather was perfect. The artists and entertainment superb. People were (mostly) well behaved. Service was brisk. I have to give a big up to the organisers on running a very sleek ship from a festival goer's point of view. A well deserved feather in the cap of Jennifer Honsbein and her team. 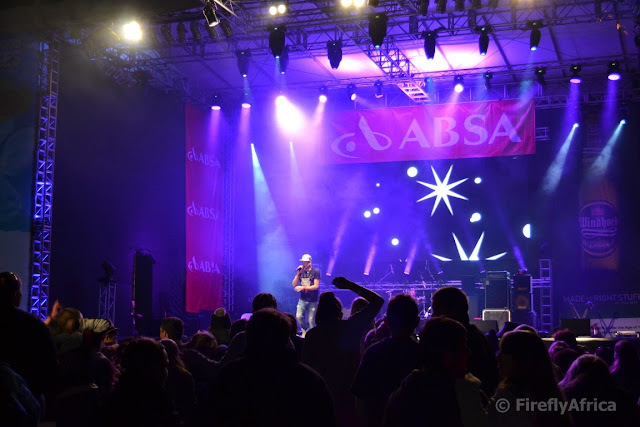 I'm already looking forward to see how they are planning to top this year when the 2016 ABSA Kirkwood Wildsfees comes around. 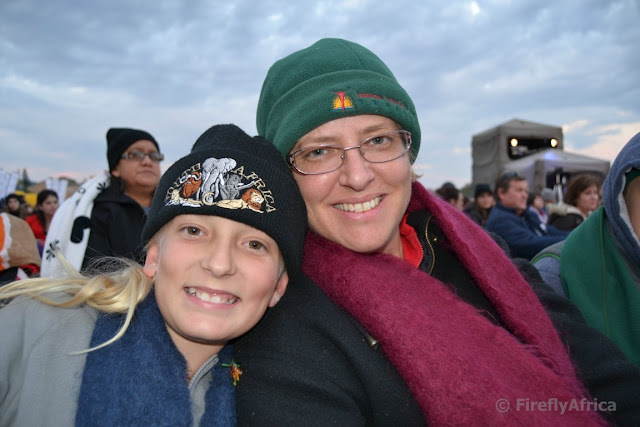 Disclosure: We received tickets to attend the ABSA Kirkwood Wildsfees from the organisares. All additional costs, food, petrol and accommodation was for our own cost. The tickets were for normal entrance and didn't allow for additional media or back stage access. I received no further remuneration, wasn't asked to write a positive post and keep full editorial control.